Hi there! 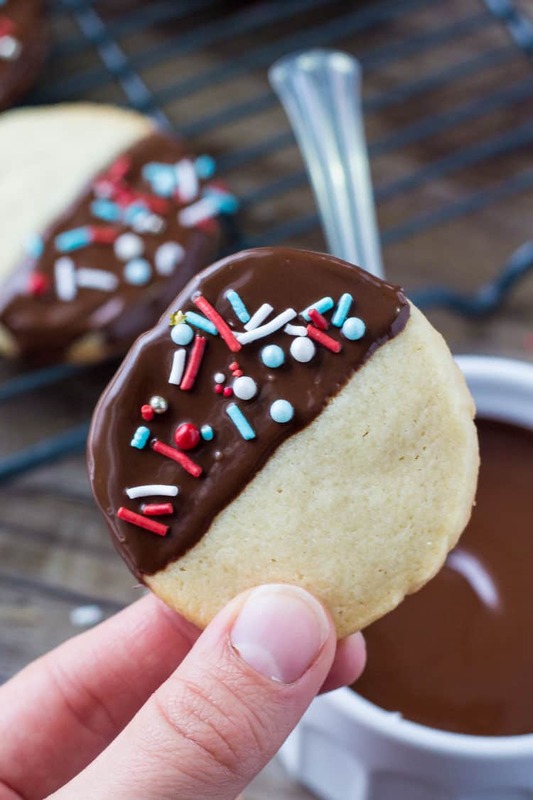 It’s Fiona from Just So Tasty, and today I’m stopping in to share these chocolate dipped icebox cookies. 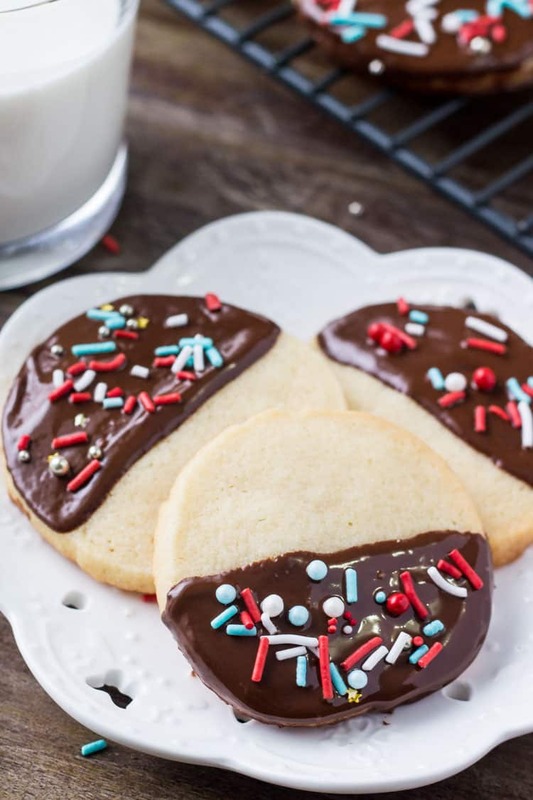 It’s a super simple sugar cookie recipe that’s soft, buttery & dipped in chocolate. They’re perfect for Christmas and super easy to make, since it’s a slice and bake recipe. Now, I absolutely love spending time in the kitchen. And I love making sugar cookies. But it’s often hard to find the time during the holidays. With Christmas parties, concerts, gifts to buy, presents to wrap, etc – it can be hard to find the time for holiday baking. Which is exactly why I wanted to share these icebox cookies. It’s the perfect cookie recipe for making ahead of time – so you can whip up the dough before the craziness of of the holiday starts, freeze it, then have fresh cookies just in time for Santa. To get started, we first mix together butter and sugar until it’s fluffy. Then mix in one egg and a little vanilla and almond extract. The almond extract is option – but I find it adds so much flavor. Then we mix in the dry ingredients, and our cookie dough is done. The cookie dough then gets formed into one big log shape and wrapped in wax paper. You can either chill the dough in the fridge for 2 hours or up to 4 days. OR, you can freeze it for up to 3 months. If you’re freezing the dough, you’ll thaw it in the fridge overnight the day before you want to bake the cookies. Then when you’re ready for cookies, slice the log into round discs and bake. 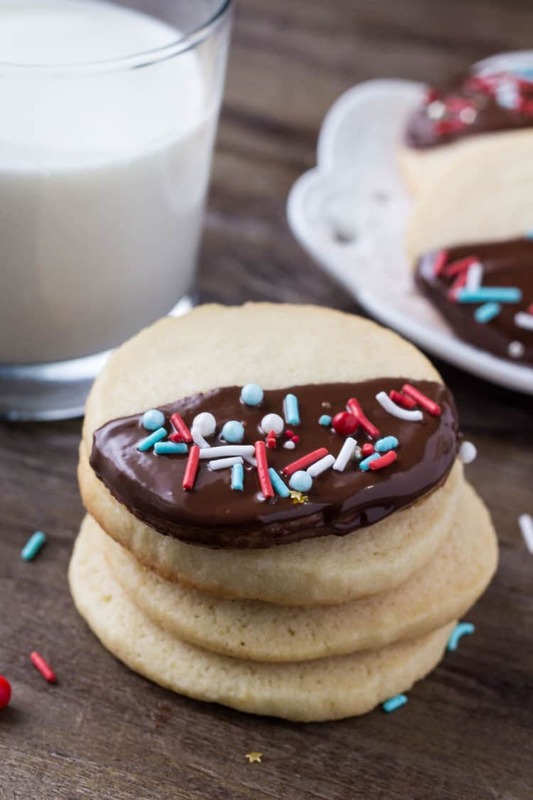 Finally the cookies are dipped in a little chocolate and showered with sprinkles. 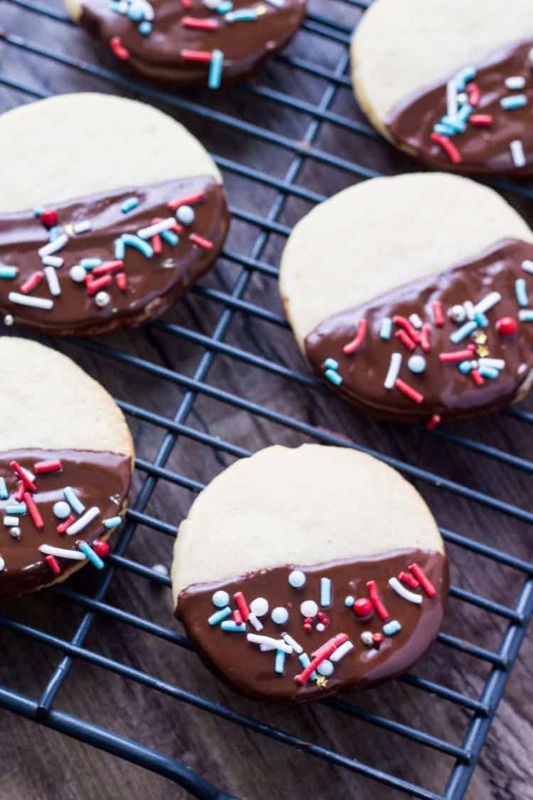 These chocolate dipped icebox cookies are the perfect make-ahead cookie recipe for the holidays. And if you’re looking for an easy sugar cookie recipe, then these are for you! You might also enjoy these holiday treats: Candy Cane Chocolate Fudge, Snowball Cookies, and Copycat Ghirardelli Dark Chocolate Peppermint Bark. Or, better yet, check out our delicious collection of 25 Days of Sweets: An Ode to Sugar and Holiday Sweets. 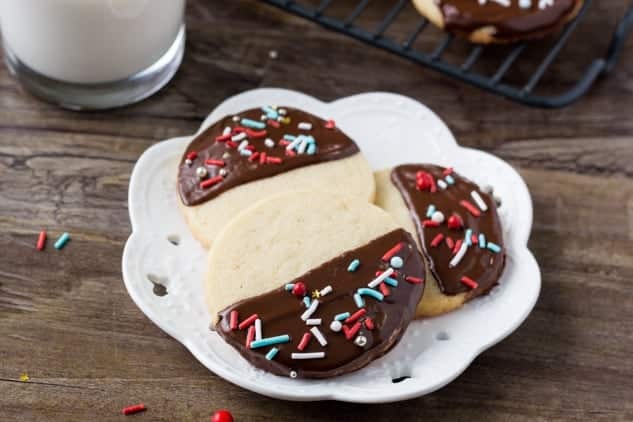 These easy chocolate dipped icebox cookies are the perfect make-ahead recipe for the holidays. Soft, buttery, dipped in chocolate & decorated with sprinkles. In a large bowl beat together the butter and sugars until fluffy. Then beat in the egg, vanilla extract & almond extract. With the mixer on low speed, mix in the flour, cornstarch and baking powder. Place a sheet of wax paper down on the counter, and place the dough on it. Make sure to place the dough on the sheet of wax paper - it will stick to your countertop otherwise. Form the dough into a log shape about 1 to 1.5 inches in diameter and and wrap in the wax paper. Then twist the edges of the was paper. Chill the dough in the fridge for at least 2 hours, or up to 4 days. Or place the log in the freezer for up to 3 months. If you put the cookie dough log in the freezer, thaw in the fridge the night before baking. When ready to bake, preheat the oven to 350F degrees and line baking sheets with parchment paper or silicone baking mats. Slice the log into round discs about 1/3 to 1/4 inch thick. Place cookies 2 inches apart on the baking sheets and bake for 9-11 minutes or until tops are just set. In a small bowl Melt chocolate chips with the shortening in the microwave in short 30 second bursts, stirring between each interval. Then dip half of each cookie in chocolate, and sprinkle your favorite spinkles on top.